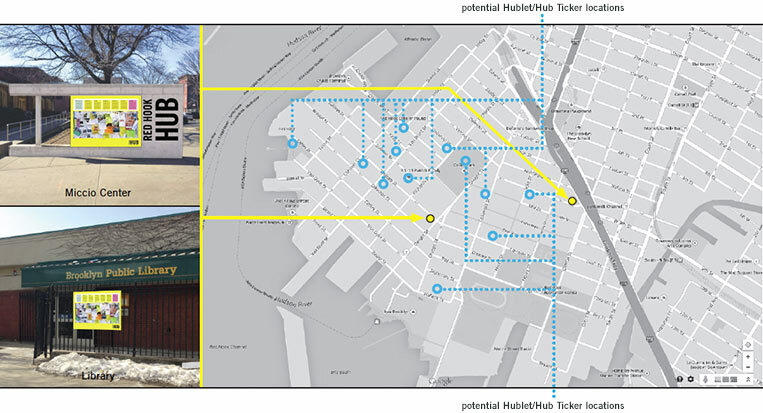 The Hub is a public communications system that helps inform, connect and engage the Red Hook community. Developed as part of the AIGA/NY Design/Relief initiative in Red Hook, it collects and displays information based on community needs. 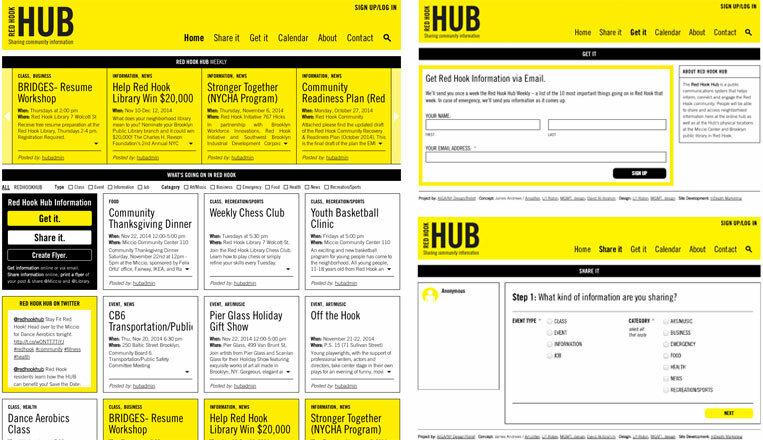 The Hub is a system of physical and digital community bulletin boards that connect the community. When Hurricane Sandy hit New York City in October 2012, the waterfront neighborhood of Red Hook, Brooklyn, was largely unprepared for the storm’s fury. The physical vulnerability of the area was matched by a fragile system of communication that left many residents wondering what to do, both during and after the disaster. The Hub is a new communication system that will make sure Red Hook stays informed about future emergencies—and everything else that’s going on in the neighborhood, one of New York’s most exciting places to live, work and visit. Working with AIGA/NY’s Design/Relief initiative, Li’l Robin developed the project as part of a team that includes the design studio MGMT. design, the non-profit strategists Amplifier Project, and the communications specialist David Al-Ibrahim. 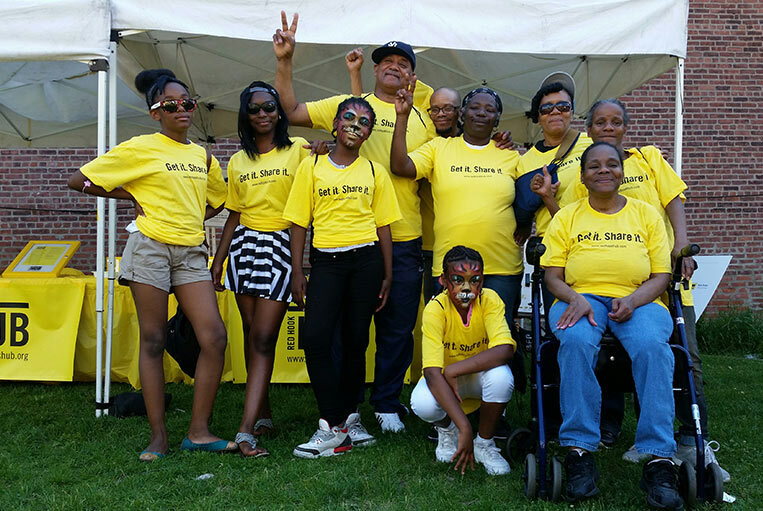 Introducing The Hub at the Red Hook Fest, June 16, 2014. The Hub bulletin boards and locations. The Hub is a public information system that collects and displays information based on community needs. 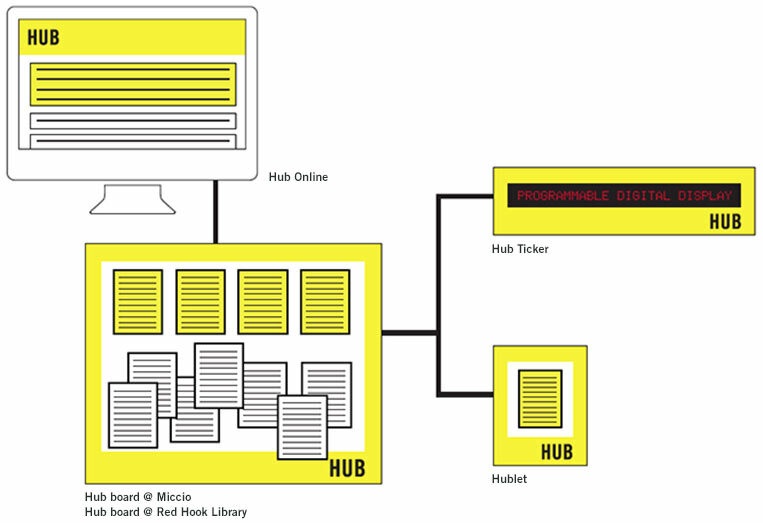 Conceived as a kind of 21st century bulletin board, The Hub functions as a flexible network of physical and digital platforms that connect the community. Information is shared on two large-scale bulletin boards and a dynamic digital ticker, as well as multiple “Hublets” throughout the neighborhood. The physical postings are augmented by a website (redhookhub.org), a weekly email update, and social media (Twitter). As its name implies, The Hub gives the community somewhere to go for reliable information, and in an area without a true center, strategically spreads out to meet residents wherever they live. The Hub was developed through a community-driven process that focused on building partnerships and engaging the public. We worked closely with members of the community, talking to residents, small business owners, neighborhood leaders and activists, and other stakeholders in a series of meetings, presentations, one-on-ones, site visits, and workshops—not to mention many informal conversations, which we valued as much as the official communications. Meetings, workshops, and testing throughout the year. At the Red Hook Hackathon at Pioneer Works, April 18-19, 2014. At various stages we met with the Red Hook Houses East and West Tenants Associations and the Red Hook Initiative, an advocacy group for youth empowerment. 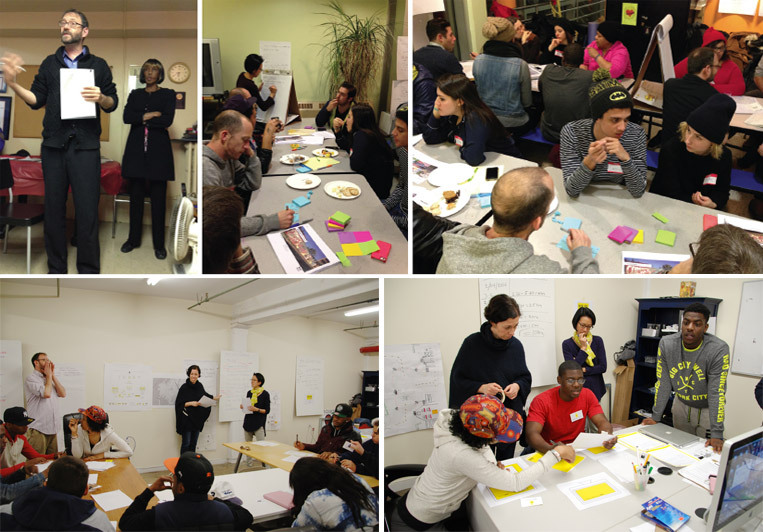 We presented a community design charrette at the Miccio Community Center, and started development of the website at the Red Hook Hackathon, held at Pioneer Works, an art and science center in the neighborhood. (The finished website was programmed by Tim Halbach.) Community partners in The Hub include the Brooklyn Public Library’s Red Hook branch, Red Hook Initiative’s Digital Stewards RH Wifi Program (which is providing online coordination, website content, and a Hub coordinator), the Red Hook Coalition’s Communication Working Group, and Good Shepherd Services, a social services agency. 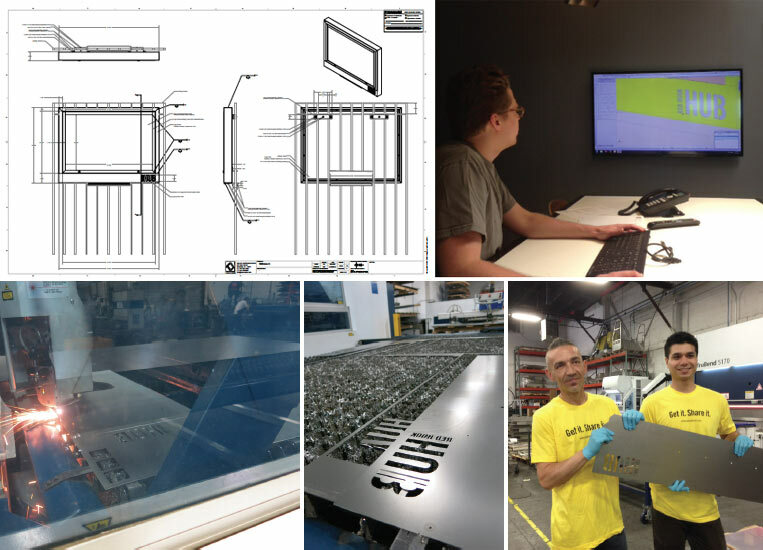 Fabrication of the Hub boards and ticker was completed by Kammetal, a metalwork shop based in Red Hook. The Hub bulletin board fabrication at Kammetal. The Hub concept was first introduced to the public at this summer’s Red Hook Fest, where visitors had an opportunity to test-drive the system and pick up Hub swag, including t-shirts and stickers with the Hub taglines “Get it. Share it.” and “We are Red Hook.” Responses to the program so far have been remarkably enthusiastic and positive, and we’re currently in the process of handing over maintenance of the program to the designated stakeholders. Red Hook Hub ribbon cutting event at the Brooklyn Public Library in Red Hook, December 6, 2014. Since the launch of our project in December of 2014, we have seen how it makes a difference and improves communication in Red Hook during both crisis and non-crisis conditions.